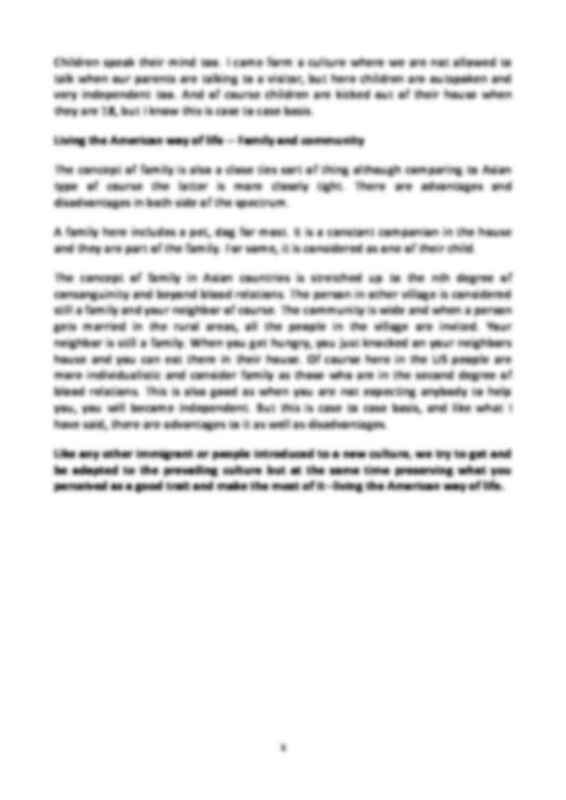 The American way of life is characterized by an openness and accomodation. It is not at all difficult for acculturation because it embodies practices and lifestyles which are easy to adapt too. In the process of acculturation it is up to the individual to know which values to use and give importance too. It is more advantageous to adapt yet preserving good values you have brought into the system. 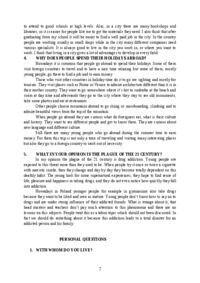 When we say way of life, it is describing the culture of a group of people in a particular place. What is a culture? Culture is the set of shared attitudes, values, goals, and practices that characterizes an institution, organization or group. It is the way you do things, like for example culture of eating. Festivities and holidays are also part of culture. Beliefs, like religious belief is part of culture. We know for a fact that when we say Americans, we are dealing with multitudes of different people that comprises the nation. Ask every American and they will tell you, a part of their ancestry is Europeans, Africans and some Asians. There are native Americans too. America is a melting pot of all people with different ethnic background. This is my own perspective of American way of life being a Filipino immigrant. I like the way the kind of life here gives so many choices and you are free to become the way you want to be. Living the American way of life in terms of food -- Fast food is the way to go. Every corner or every street in America has a fast food. Burgers and fries ----Mc Donalds, Burger king, Whataburger, Taco Bell, pizzas--Papa Johns, Pizza Hut, Dominoes, sweets-- IHop, Dennys etc. Mc Donalds is the favorite place to go. Hamburgers, fries and Coke or Mountain dew is the basic meal. Oh, I cant finish a quarter pounder, it is too big for me, I always keep it and eat the rest later. There are a lots of ice cream, cakes, chocolates and candies. Wow, yum, yum, yum. They sell everything sweet. I see all the variety and the likes in every store and I am thinking this is like heaven for a child. Of course I am still thinking how it will affect the general health of people. American culture is very accommodating, you can find lots of restaurant for Asians, Latinos and Italians, Australians, English, French etc., you name it. And mind you, Americans love beer too. Miller, Budweiser, lagers, Heineken are some few popular beers. Since I am in Texas, I drink Corona -- Mexican beer (almost the same taste as San Miguel Beer in the Philippines) from time to time too. American style breakfast are pancakes, syrup, sausage , bacon strips, and fried eggs. Let us not forget turkey too on Thanksgiving and fried chicken. There are many varieties of fruits, oranges, grapes, apple, cherries, blueberries. When I came here it is the first time I saw the last three fruits, we don't plant those fruits in the Philippines. Sometimes, I go to Asian store and experiment on mixing available vegetables with Asian sauce. The thing here is that all things are bigger, eggplants, apples, onions, garlic etc. It is like triple the size of the fruits and vegetables I am used to. This is also true in Europe, this is maybe because they have different kind of agriculture, or better technology and that's why they can make small fruits variety bigger and juicier at the same time. Organic foods are more expensive though, so the more poorer you are, you dont have a choice but to eat what you can afford. … too like the Britons and Aussies. I guess all people in the world are addicted to some kind of sports which they are more attuned to. Football, baseball and basketball are the most famous sports here. Most like wrestling too, if you would consider that a sports. Sunday from early September to Super bowl in February are considered holy Sunday for football fans. It is a joke that even when you go naked in front of your partner on that day (Superbowl), he will not blink an eye away from the TV. It goes with beer drinking too while watching the sports. … of cursing etc. Children speak their mind too. I came form a culture where we are not allowed to talk when our parents are talking to a visitor, but here children are outspoken and very independent too. And of course children are kicked out of their house when they are 18, but I know this is case to case basis.